KRASNODAR, June 9. /TASS/. Russian archaeologists hope to continue archaeological excavations in ancient Palmyra after rehabilitation of the Syrian city of Tadmor, on the territory of which the historical marvel is located, a leading Russian expert said on Friday. Dr. Natalya Solovyova, a Deputy Director of the St. Petersburg-based Institute for the History of Material Culture said this on the sidelines of the festival titled ‘Russia’s Antique Heritage’ in the southern city of Krasnodar where she did a public presentation of the 3D model of Palmyrene monuments. "We hope we’ll manage to do some archaeological excavations there because our Institute made an arrangement on them with the Syrian government in spring 2015, several days before the start of combat actions [in the Palmyra area]," Dr. Solovyova said. "We didn’t sign the documents then, however, because armed fighting began." "Still we do hope we’ll have an opportunity to come there again and to continue our work after the restoration of Tadmor, which is the contemporary city," she said. Dr. Solovyova confirmed the Russian expert community’s plans to join restoration of the antique city. Specialists from the Institute for the History of Material Culture, the State Hermitage Museum and some other research and cultural institutions made a trip to Palmyra in September 2016 after its first liberation from the militants of the Islamic State terrorist grouping. They made pictures of the site, including the aerial ones that helped them design the 3D model of the city. The model makes it possible to assess the scale of destructions and to draw up plans for the future restoration. The experts also did scrupulous work to integrate the digitalized photos of Palmyra made in previous epochs - an effort that added importantly to their final product. Another weighty factor that allows the Russians to hope for broad engagement in the restoration activities is the encouraging attitude of the Syrian government. "The Syrian leaders treat us well," Dr. Solovyova said. Russian experts have already submitted proposals on restoring the Temple of Baal Shamin, one of the main relics of the place. Specialists say its restoration is possible although the militants demolished it. "Our military told us that, by a lucky chance, those who destroyed it were unskilled demolishers and many large fragments [of the building] survived as a result," she said. "The temple can be restored and it’s up to UNESCO to decide on whether or not the lost elements of it will be replicated." "This will require a lot of financing and quite some time but still it’s possible," Dr. Solovyova said. She also did not rule out that the researchers would get an opportunity to excavations at the site of the temple in the future. Although numerous archaeological expeditions have worker in Palmyra in the past, the ancient city still something to reveal to the world. Palmyra, often referred to as the Bride of the Syrian Desert, was a notable center of commerce and culture at the crossing of trade routes in antiquity. It reached particular grandeur in the 1st and 2nd centuries AD. A number of illustrious architectural monuments relate to that period. They survived two millennia but turned up in the epicenter of a debacle in the second decade of the 21st century. 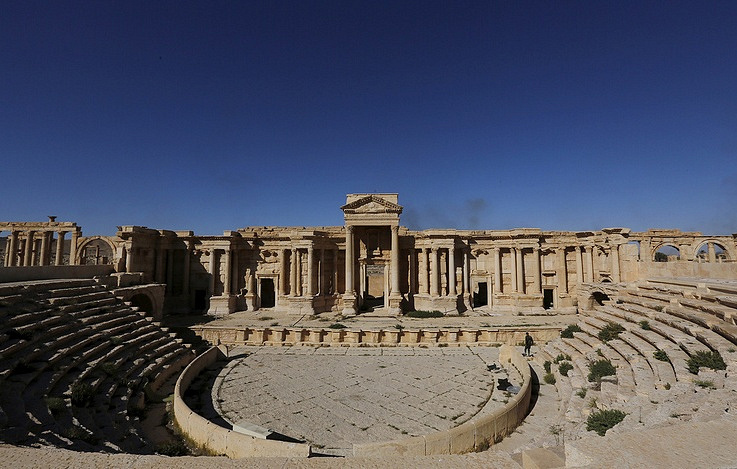 UNESCO placed Palmyra on its list of world cultural heritage sights. The militants who controlled Palmyra from May 2015 through March 2016 and from December 2016 through March 2017 destroyed a number of monuments. ‘Russia’s Antique Heritage’ festival is held in the southern Krasnodar region from June 1 through June 12. The region's territory incorporates the entire Russian section of the Black Sea coast. The itinerary of the festival reaches out to the cities of Gelendzhik, Anapa, Novorossiysk, and Temryuk, in the areas of which Greek colonies of antiquity were located.